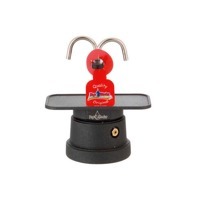 Steam-Brew Rich Italian Coffee with a Charming Mini Espresso Maker! 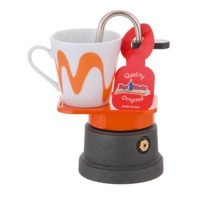 The Mini Espresso Maker from Top Moka steam-brews strong, espresso-like coffee in about five minutes. Made in Italy from the finest materials, this Coffee Maker is available in either a single- or double-cup design. Boxed sets with matching cups and saucers make the perfect gift! 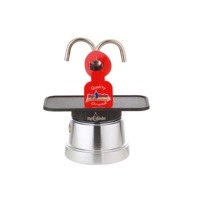 Order a Sophisticated Mini Espresso Maker Now! Rich coffee for two has never been easier! Add the Mini Espresso Maker Black Double Cup to your kitchen to automatically dispense espresso-like brew directly into your favourite mug. The aroma alone is enough to lift your spirits and brighten your day! Just the right size for two, the Mini Espresso Maker Silver Double Cup dispenses steaming-hot Italian coffee that wakes you up and brightens your day! Grab a cup directly from the Moka Pot or use the convenient handle to carry this attractive Mini Coffee Maker to the table! Now, you can upgrade your cooking surface to an induction hob and still enjoy rich Italian coffee at home! The Mini Espresso Maker Silver Double Cup (Induction Hob) has a titanium-alloy base that works perfectly on induction hobs! 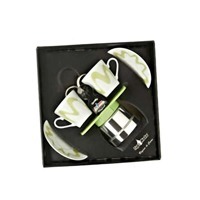 Perfect for couples or roomies, the Mini Espresso Maker Silver Double Cup Queen of Hearts Gift Set brews two cups of rich Italian coffee in just five short minutes! 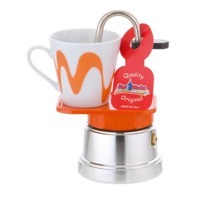 A great choice for weddings, anniversaries, graduations, retirements or any special occasion, this charming Moka Pot provides years of attractive and functional use! When you need an intense cup of coffee, the Mini Espresso Maker Silver Single Cup delivers a steaming mug of caffeinated ambrosia in about five minutes! Wake up instantly with this espresso-like coffee elegantly dispensed by your new Single-Serving Moka Pot! 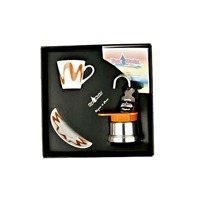 If you know someone who can’t go a day without a strong cup of coffee, give them the Mini Espresso Maker Silver Single Cup Queen of Hearts Gift Set! Perfect for birthdays, Christmas, anniversaries or any special occasion, this attractive matched set will remind them of you with every cup of rich, espresso-like brew! This little coffee machine is just amazing, easy to use, quick, easy to clean, looks cute, space saving, much much better than all those large fancy expensive machines and a fantastic strong cup of coffee also, strong enough to knock your head off. Wish I had seen these years ago, I cannot rate it highly enough. Yummy stuff.